A subsidiary of Rick's Cabaret International, Inc., (Nasdaq: RICK), a leading hospitality company with restaurants and gentlemen's clubs nationwide, purchased 49 percent of a corporation that operates the Dallas club "PT's Platinum." Total cost of the transaction was $500,000, with $130,000 allocated to the acquisition of 49 percent of the shares of Manana Entertainment, Inc., which operates the club on behalf of VCG Holding Corp., and $370,000 to purchase the building and personal property. Under the agreement Rick's Cabaret president and CEO Eric Langan will become a vice president and board member of Manana Entertainment. "We are very pleased to have reached this agreement with VCGH and look forward to working together to make this club an even stronger competitor in the growing Dallas-Fort Worth entertainment landscape," Mr. Langan said. "We already own and operate 11 restaurants and clubs in the DFW market and we will be able to leverage our strong buying power and other efficiencies on behalf of PT's Platinum. The club is located at 2151 Manana Drive in Dallas, just west of Stemmons Freeway. 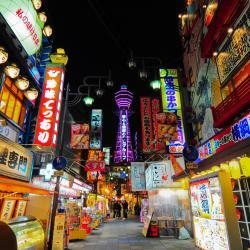 Japan: The Next Casino Gaming Frontier?